Pokémon Go Fest got off to a solid-enough start before the vast majority of people were let into the park. As a member of the media, I was allowed in with an early batch of attendees, and we had a chance to experience the Fest before it was in full swing—before technical issues totally crippled the fun. Once inside the Fest, you’d need to walk up to any of the special PokéStops on the map and spin the disc, which then prompted you to scan the QR code that Niantic provided alongside your NFC chip-packing wristband. After that, you were enrolled in the Fest’s digital activities, which meant your Pokémon captures would be tallied and added to the totals needed to gradually unlock the legendary monsters during the three challenge windows, plus heaps of Pokémon suddenly appeared on the map. Good start. Before 10:00 a.m. hit and more people were allowed in, I began walking the special pathway created within the fest, which spanned a number of marked PokéStops that would award special 2km eggs to hatch. I figured I’d probably walk that path several times throughout the day, and had spent about $10 to purchase several extra incubators to make sure I could hatch a load of them before the Fest’s end. By the time I reached the #6 stop on the map, I ran into a problem. The game wasn’t responding, so I closed the app and tried opening it again—and it wouldn’t let me sign in. I tried again and again with no result. At this point, I was on the far outskirts of the fest, so I decided to head back towards the main stage area, and see if I could login using the Wi-Fi near the media area. After about 15 minutes offline, I finally got back in right as the crowds began building inside of the park. Phew. Just a small hitch, right? Like the nearly 20,000 other attendees, I was thrilled about the prospect of Pokémon Go Fest. I’ve covered the game extensively for Macworld since before its release last summer, but more importantly, I’ve been playing it for fun—sometimes solo, or with my wife and son. All told, I’ve spent dozens of hours capturing thousands of Pokémon, making thousands of PokéStop visits, and hatching loads of digital eggs. 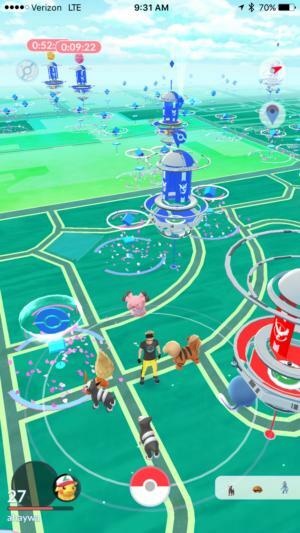 Pokémon Go Fest promised the ability to catch rare monsters, team up with lots of other players to tackle the new Raid Battles, and the opportunity to unlock and capture top-tier Legendary monsters, which would finally be added to the game for the occasion. Instead, the game collapsed under the weight of all of the player demand—and cellular networks likewise failed to accommodate the thousands of simultaneous connections coming from Grant Park in downtown Chicago. As more and more people flooded the park, the situation just got worse, and fans became expectedly upset and very vocal about it. In my case, my most significant finds were a gnarly sunburn and a wasted day full of frustration.